"Daddy, when can we go to a REAL park?" 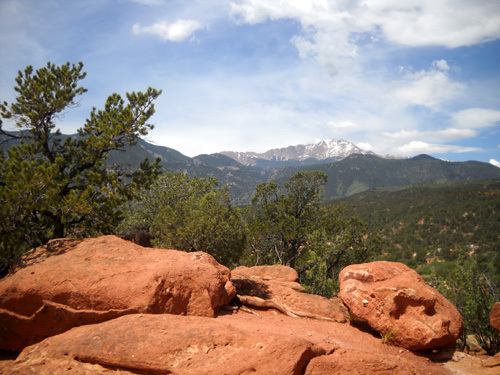 This beautiful park at the base of Pike's Peak is one of my favorite places to explore. It's not your average urban or suburban park, as this little boy observed. I guess he prefers playground equipment and ball fields and newly-mown turf . 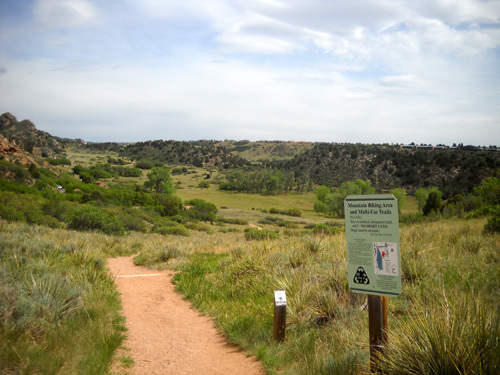 . .
Main park entrance; trail on right connects to the visitor center and Foothills Trail. 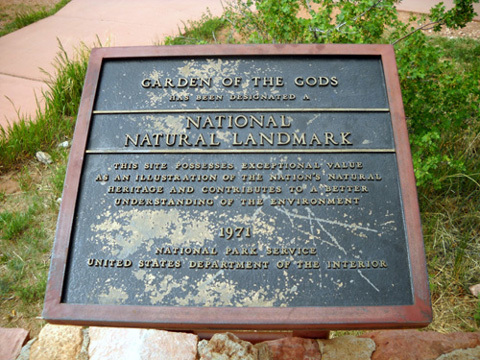 "Filled with the wonders of nature, the Garden of the Gods was dedicated in 1909 as a free city park. 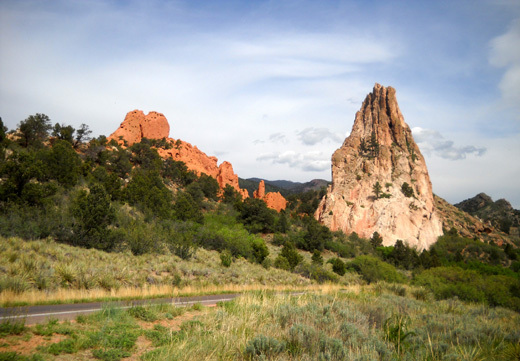 An abundance of plant and animal life can be found throughout its 1,350 acres, as well as the magnificent red sandstone rock formations that have made it world-famous. 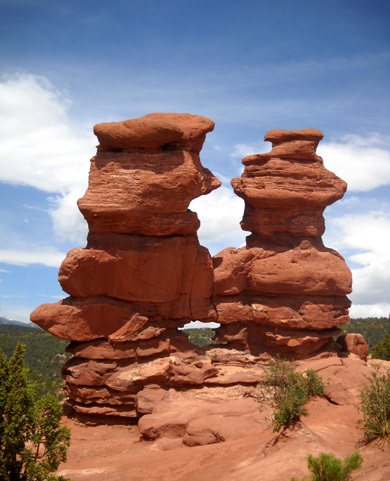 Many of the formations are over 300 million years old and were sculpted through time by the forces of nature . 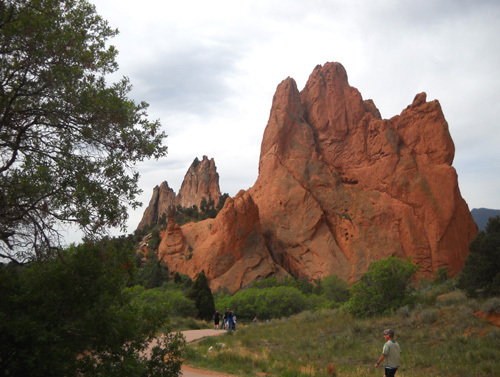 . . No trip to Pikes Peak Country is complete without a stop in the Garden of the Gods, a registered national landmark." 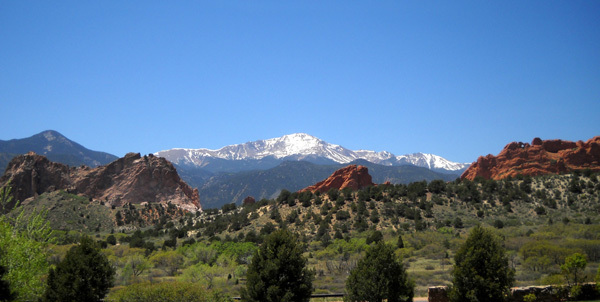 Like Pike's Peak, Garden of the Gods is managed by the city of Colorado Springs. It was bequeathed to the city by railroad magnate Charles Elliot Perkins with the stipulation that it remain open and free to the public. The impressive visitor and nature center is also free, although it offers several options for spending your money! Donations are also welcomed. 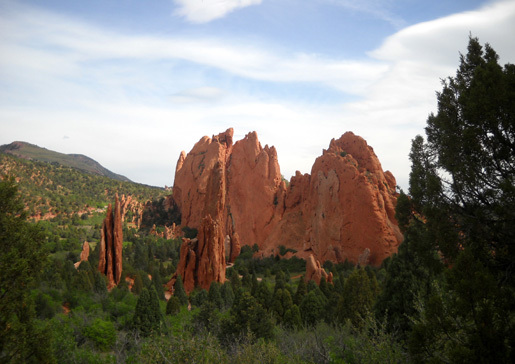 The Garden of the Gods Foundation is a non-profit organization that helps preserve and maintain the park through grants and donations. I don't know how much of the upkeep comes from local tax dollars but if I was a resident of Colorado Springs, I wouldn't mind seeing my local tax dollars being used this way, either (same thing I said about the Olympic Training Center in a previous entry). 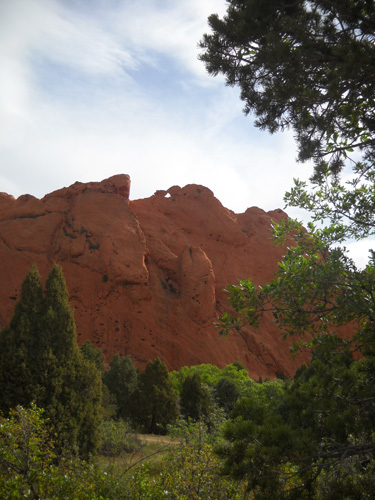 Garden of the Gods truly is a national natural treasure. That day we didn't have time to drive or hike through the park, however. I wanted more . 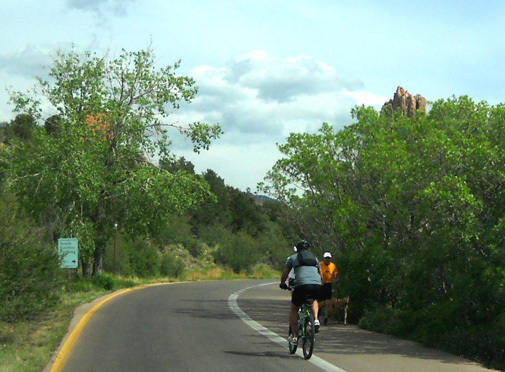 . . driving by Garden of the Gods isn't the same as walking amongst the rocks. It'd be like a drive-by at Bryce Canyon without getting down in those hoodoos: just not the whole experience. Since this is our last full day in Colorado Springs, Jim wanted to stay at the campground and do some work on the truck and camper. 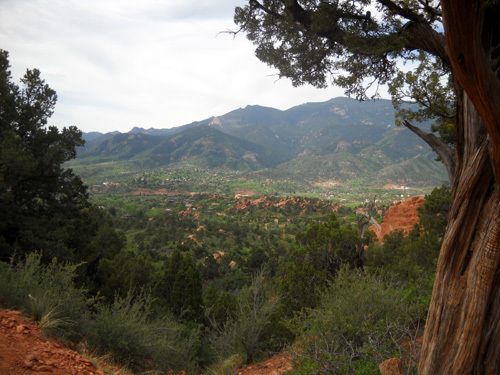 Cody and I went out exploring Garden of the Gods and several other local parks. 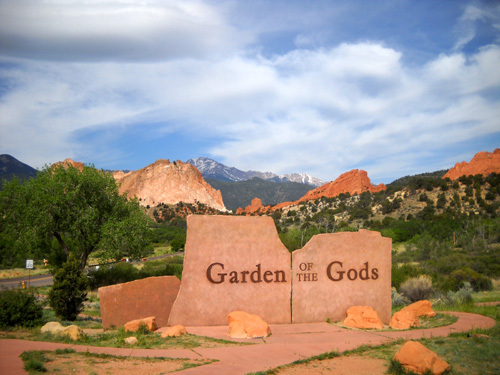 So how did Garden of the Gods get to be called that? Imagine standing here 150 years ago. 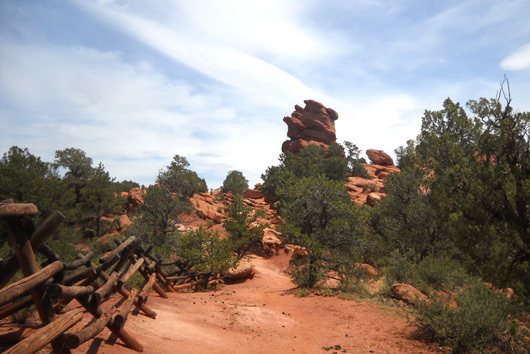 You observe a red rock wilderness, no settlement nearby, and footpaths traveled by American Indian people for centuries. What would you name this place? 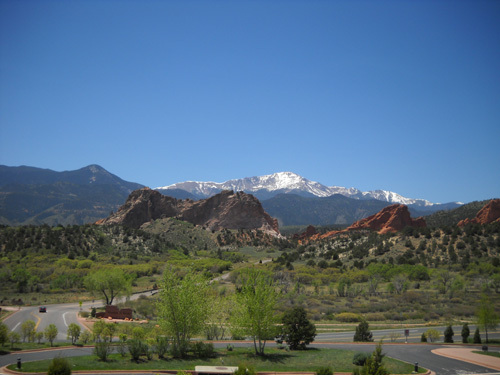 Back in 1859, not long after the "Pikes Peak or bust" gold rush began, a group of men explored the nearby area to determine a place for a town site at the base of Pikes Peak. 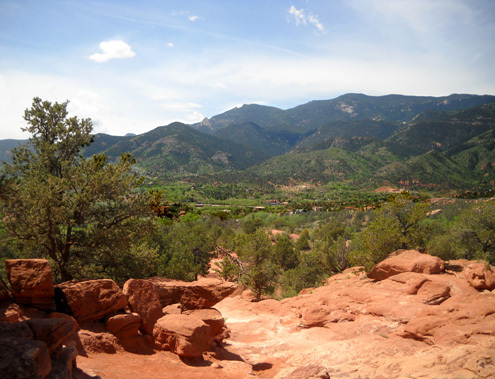 They named their new town "Colorado City," as "colorado" is Spanish for "red," like the surrounding land. As they looked over this area of cathedral-like rock spires, one man, Malancthon Beach, commented that the spot would be a great place for a beer garden someday. His friend, a poetic young man named Rufous Cable, replied that it was a place "fit for the Gods." 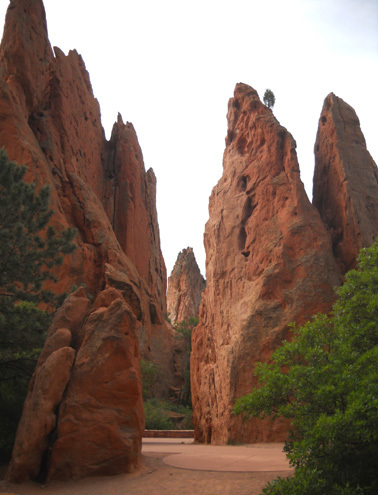 The name Garden of the Gods has expressed the awe and admiration felt by Cable and by visitors ever since. 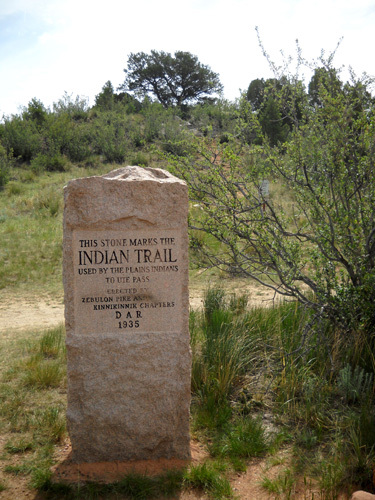 It should be noted that when Charles Perkins bequeathed the land that is now park property to the city of Colorado Springs, he and his heirs stipulated that "no intoxicating liquors be manufactured or sold within the park." I assume that included beer! I spent about three hours in the morning hiking various trails and photographing the rock formations before the temperature climbed into the upper 70s. 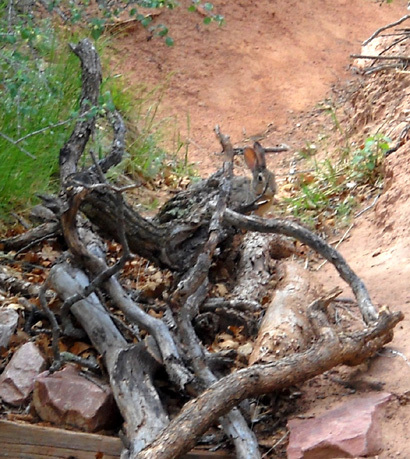 A well-camouflaged rabbit -- can you see him? eavesdropping inconspicuously (hard to ignore their chatter!) on comments made by visitors walking near me, and just generally enjoying the gorgeous day and perfect weather. On days like this, I don't even miss not being able to run any more. If I'd been running, I would have missed a lot. 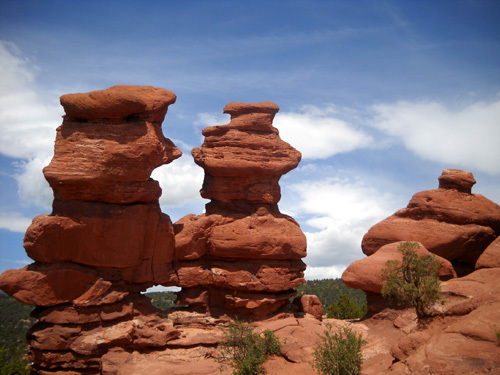 The towering red sandstone formations are the main draw in the park. You can simply enjoy them without knowing their "names" or geological history, but I enjoy them even more after learning how they got there and what they are called. I mean, aren't the Kissing Camels and Siamese Twins more interesting if you know that's what they are called?? 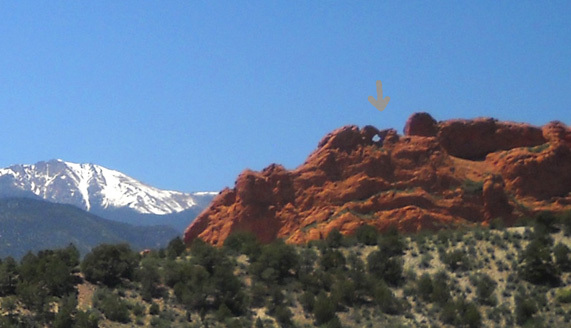 You can see the Kissing Camels from the visitor center and main entrance on the east side of the park (see arrow below) . . . 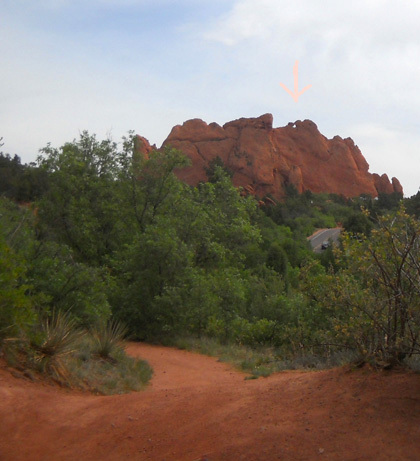 The Kissing Camels look quite different from the west side of the formation (above and below). The Camels are visible along the dirt single-track Palmer Trail heading north. 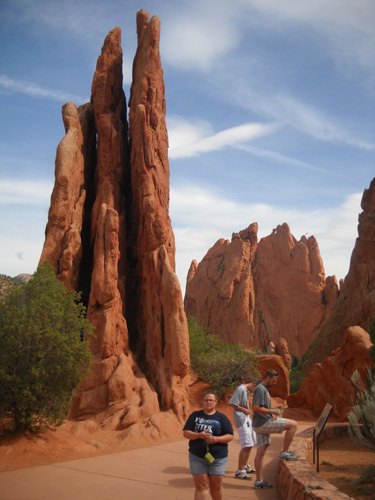 I think it also enhances the experience to understand how the rocks were formed over 275-300 million years. 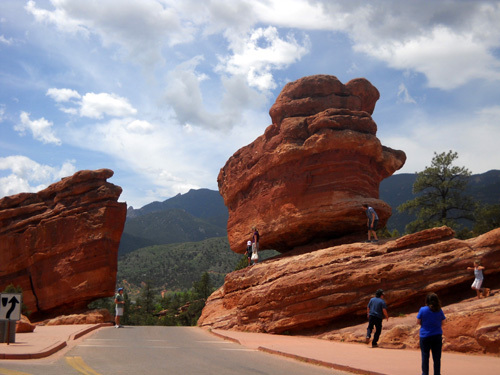 An easy way to learn about the geologic history of the park is to watch the 14-minute HD Theatre multimedia show in the visitor center to "see how those red rocks got there." The show costs $5 for adults and $2 for children. If you're in a hurry or don't want to spend money on the movie, you can pick up a free brochure with graphics and text that explain the geological processes. 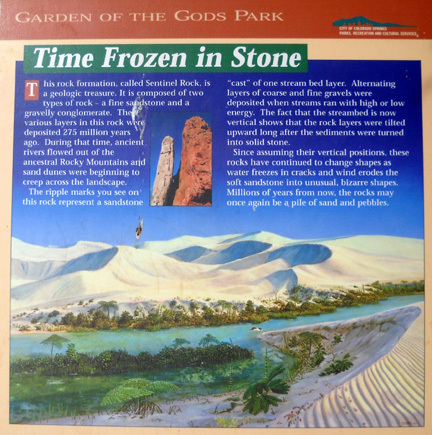 Or just browse the interpretive displays in the visitor/nature center and along the trails. It's all good. The visitor center, located on the northeast side of the park, also offers cultural and ecological exhibits, fossils, nature talks, maps, brochures, a museum, bus and Segway tours, and information about other things to see and do in the area. There is a bookstore, gift shop, and indoor/outdoor cafe. 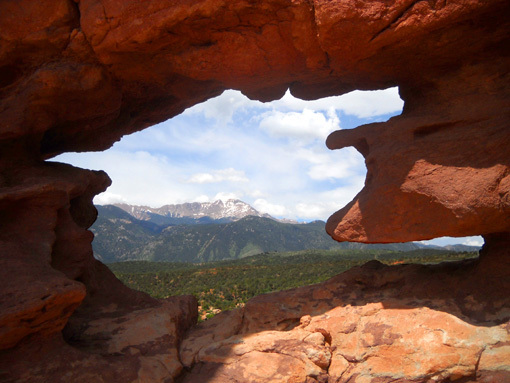 Views of the park and Pike's Peak are pretty cool from the large terrace. 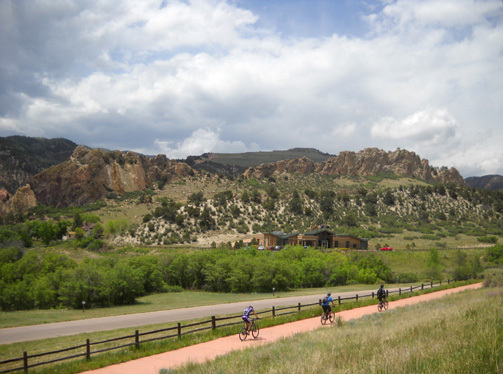 Recreational activities in the park include exploring up to fifteen miles of paved and unpaved trails on foot, horseback, or bicycle, guided nature walks, rock climbing, scenic drives on mostly one-way loops, picnicking, wildlife viewing, and photography. As tough as it can be to find a place to park on a busy day, walking, running, or riding in on a bike is a great idea! 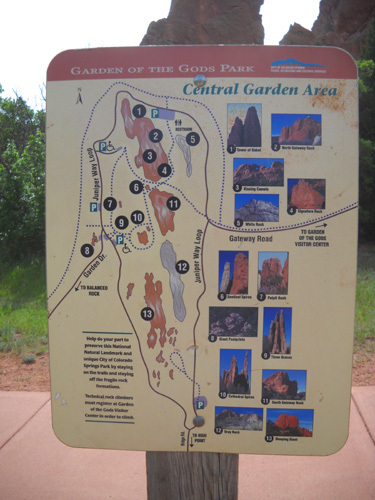 You can pick up a free colored trail guide in the visitor center and use that to locate trailheads, distances, and featured rock formations; I don't think the map is on the park website. that shows the trails and various rock formations. 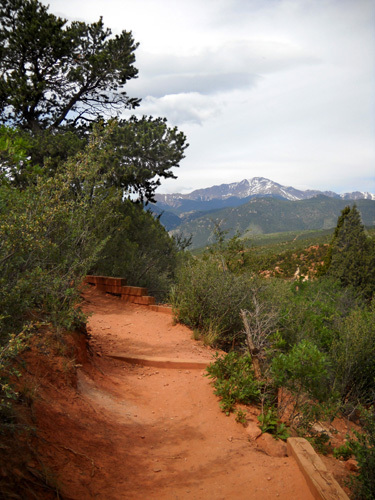 * All of the trails within the park are open to hikers and runners. * Equestrians are allowed on several designated trails but I didn't see any horses today. runner and his dog. Most of the park roads are one-lane like this. What I've seen of the Palmer Trail is undulating and mostly smooth. The Siamese Twins Trail (above) and upper loop are more challenging. A paved path winds through the Central Garden Area. Erosion is a major concern in this kind of terrain. 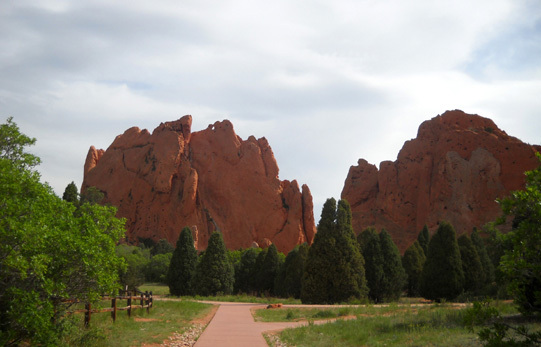 Several park rules, like staying on trails and not taking home samples of rocks, are designed to protect the environment and preserve the natural resources. 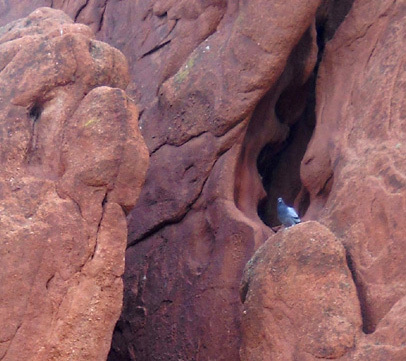 Not only can indiscriminant climbing destroy the fragile formations, it is also dangerous. 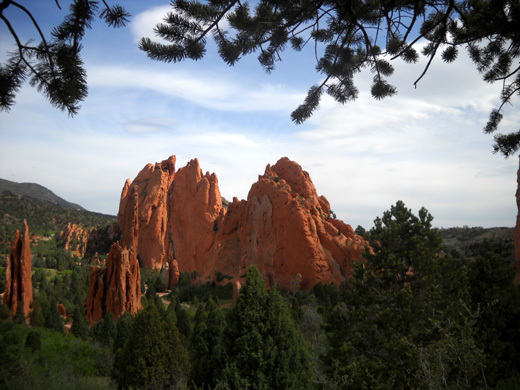 Throughout the park's 100+ year history several serious and fatal rock climbing accidents have occurred. 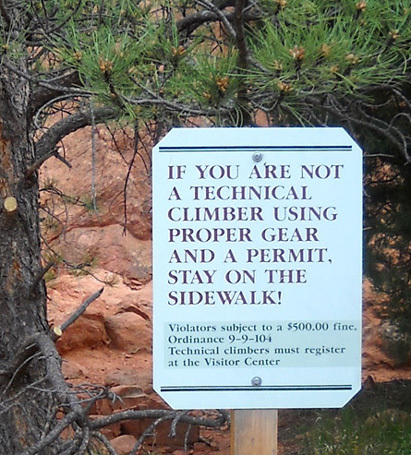 If you want to rock climb, check out the park website re: how to do it safely and "legally." There was a young man sitting in the "window" of the Siamese Twins when Cody and I arrived on the footpath of the same name. As soon as he saw me whip out my camera he moved off to the side, behind another rock. I thanked him for not making me have to "PhotoShop him out of the picture!" He offered to take my picture with my camera, and I returned the favor. On a really busy day you may have trouble getting photos at the Twins without other people in them. Although it's a hillier, rockier walk to reach the formation, it's one of the most-photographed spots in the park. There are four access streets into the park and two one-way loops within the park. Trying to cover all of them without some repetition or back-tracking is impossible but they are all short enough that it's only a problem if the park roads are really crowded and you're creeping along. If that happens, just keep your cool and enjoy the views! 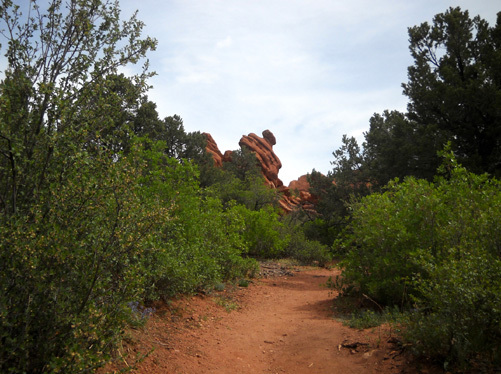 I pulled over several times to check out other trails and rock formations I'd missed while walking, including the popular Balanced Rock and Steamboat Rock along Garden Drive in the SW part of the park. It's hard to get pictures of those without strangers in them but at least they give some perspective to the size of the rock formations. There are trailhead and picnic parking areas scattered all around the park but most of them are fairly small and they fill up quickly in the warmer months. Equestrians have a separate larger parking area near the trading post. I was able to get a parking spot quite easily when I arrived at 9 this morning but by 11 most of the parking areas were getting full -- even on a weekday. If you visit on a nice Saturday, Sunday, or holiday, arrive soon after the park opens and don't expect to move your vehicle to another spot later. 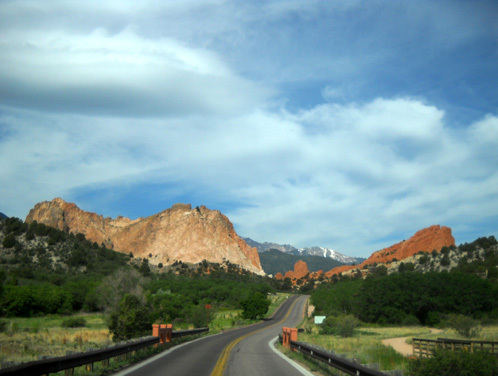 You may end up taking a scenic drive instead of a scenic hike! Check the park website for operating hours. Lots of visitors around, even on a weekday. Another tip: leave your RV outside the park unless it's a truck camper or a very small Class B or C. Most of the parking lots are too small to accommodate campers or motorhomes. Nor can they even pass through a very narrow rock formation going northbound at Balanced Rock and Steamboat Rock at the SW end of the park. I almost had to pull in the side mirrors on the truck to get through the tight one-way road on one side of Steamboat. It's to the right in the next photo, although it doesn't show how tight it is. I was too busy squeezing through without scratching up the truck to take a picture of the passageway! 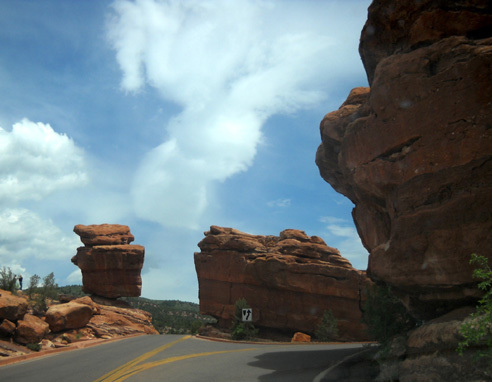 Balanced Rock, left. Steamboat Rock in center. Narrow passage hidden to the right. 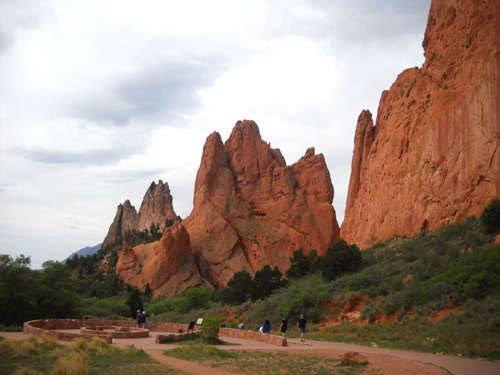 Garden of the Gods is a fun place to visit if you're in the Colorado Springs area. 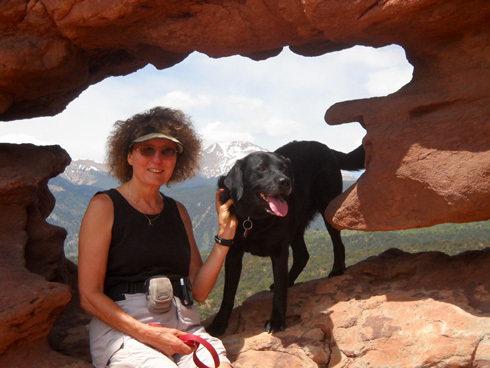 Check out the scrolling photos at the top of the home page on the park website, watch the video, click on the photos link, learn about recreational activities and tours . . . and maybe you'll be enticed to visit the park for the first -- or fifteenth -- time. Heck, if we lived near there, we'd go quite often. It's a marvelous resource. I still can't believe it's free! 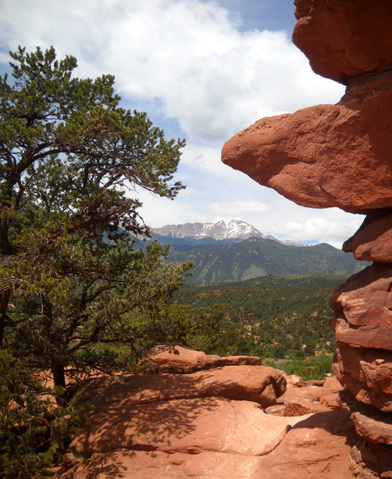 Next entry: a potpourri of things to do and see in Colorado Springs -- other parks, other activities in Garden of the Gods, another nice city neighborhood, etc.